While a certain famous frog (the one with a swine fetish) once opined, “It’s not easy being green,” today’s boat owner has more options than ever to be as green as they want. Most everyone is on board with the basics when it comes to keeping our oceans clean, but what about those potential environmental problems that arise simply as a result of properly maintaining your vessel? In efforts to help you enjoy boating without damaging the environment, these three common maintenance items and tips still take good care of Mother Earth. Lead and sulfuric acid—the primary components of a typical marine battery—can contaminate water, soil, and even the air if not handled, maintained and disposed of properly. Under the right conditions, they can also be a fire or explosion hazard. Sulfuric acid is caustic, while lead poses a serious health risk to both terrestrial and aquatic life. 1. Old batteries can’t simply be disposed of like nontoxic solid waste; they have to be recycled. 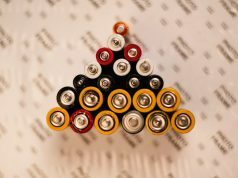 Most retailers charge you a battery core fee if buying a new battery without a trade-in, which not only offers a convenient way to dispose of that old battery but saves you money as well. 2. Replace cracked or leaking batteries immediately. Never try to drain the case of a leaking battery. Simply place the battery upright in a sturdy, acid-resistant, leak-proof container such as a sealable 5-gallon plastic bucket, and transport to a recycling center. Fluids such as oil and antifreeze may be your engine’s life-blood, but just like the acidblood of those critters from the Alien movies, they’re extremely toxic to marine life. Even more insidiously, engine fluids labeled as “environmentally friendly” are anything but when it comes time to dispose of them—even nontoxic antifreeze can become so contaminated with lead or fuel after use that it has to be managed as hazardous waste. Waste fluids generated during fall decommissioning, spring preps, or routine maintenance can easily find their way into the environment if not properly managed and disposed of. 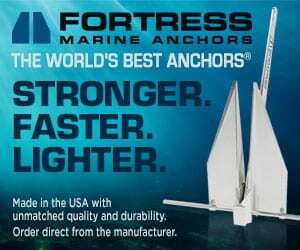 The same is true of leaking or poorly maintained engines or generators, which can introduce oil, fuel, transmission fluid, and other contaminants into the water, either directly or indirectly via leaks into the bilge. 1. Use green alternatives where possible. Go with less toxic propylene glycol based antifreeze (usually pink or orange) over those that use ethylene glycol (greenish-yellow) whenever possible. 2. Use drip pans and funnels during oil changes and transferring antifreeze, to minimize spills and drips. 3. Keep a supply of oil-absorbent rags handy for quick spill cleanups. Even small spills of oil or fuel can contaminate a large volume of water. 4. Contain and dispose of waste fluids properly. Your marina likely has disposal or recycling programs available, but there are other options as well. Automotive parts stores typically maintain a waste oil recycling station, while many household hazardous waste programs will take old, unwanted gasoline or gas/oil blends. Waste gas is typically not considered hazardous waste if it is recycled or burned as fuel, which means another possible option for stale gas is to “recondition” it by treating and mixing it with a larger ratio of fresh gas for use in less critical equipment (lawn tractors, mowers, etc.). 5. Store waste fluids separately until they can be properly disposed of. Mixing fluids can make recycling impossible and create a veritable Hell’s Broth that’s even more toxic and difficult to dispose of. 6. Maintain your engine and its systems. Inspect fuel lines, cooling system hoses and such for cracked or deteriorated hoses, leaking connectors, chafe points, etc. Correct leaks and other problems immediately. The toxicity of bottom paint should come as no surprise. Its job after all, is to kill aquatic critters and plants. Traditional antifouling paints contain elemental copper, cuprous oxide (a copper compound) or possibly old-school-style tinoxide compounds (tributyl tinoxide), all of which kill organisms in efforts to keep your boat bottom free from growth. Prepping your hull for reapplication of bottom paint can also generate deadly waste products (sanding dust, paint chips, etc.) that can find their way into the water if you’re not careful. Not only are these toxic to marine life, they can also be absorbed by edible fish and shellfish and then passed on to humans. 1. Rather than following a scorched earth approach, use low-toxicity bottom paints – those containing the minimum amount of copper needed to get the job done. Go one step better and give some of the greener, non-toxic alternatives a try. 2. 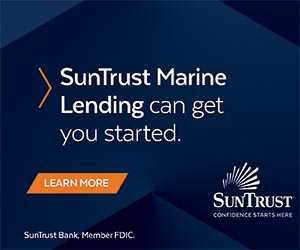 Haul your boat at a yard or marina that utilizes a closed-loop system, where runoff is collected in a settlement tank and filtered before being recycled. 3. 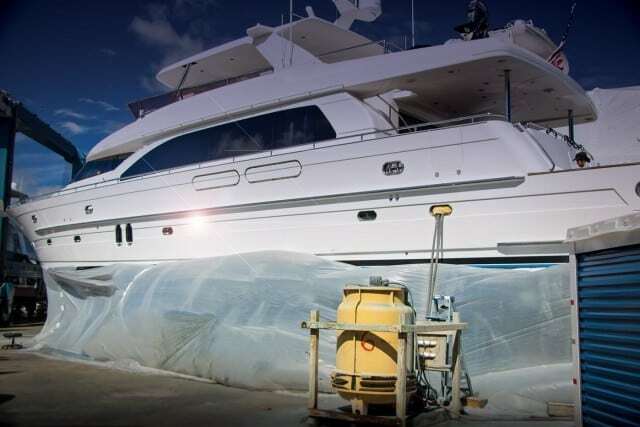 For boats that are rack stored and thus not continuously in the water, consider alternatives to antifouling paints, such as bottom wax or non-metallic epoxies. 4. When prepping or removing old bottom paint in preparation for painting, use dust-collecting vacuum sanders or environmentally friendly chemical strippers such as Franmar Soy Strip Marine Coating Remover. Use tarps and sheeting to contain paint chips, droppings and spilled materials. Weight the bottom edges of tarps and plastic sheeting to keep them in place, and when working in windy conditions, use tarps to form a windbreak to prevent flakes and residue from blowing off the drop sheet. 5. Sweep or vacuum paint chips up immediately after scraping or sanding; never use an air or water hose. 6. 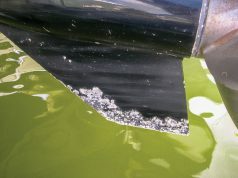 Avoid in-water hull cleaning if possible, but when conducted, use soft sponges to clean marine growth from the hull and stainless steel pads or brushes only on unpainted equipment (props, shafts, etc. ).